Hey, all, I’m Mod Manti, and I’ve been mostly in charge of balancing of the Arc, with others helping out as well. With the release date approaching (10th October) I thought it would be nice to share some numbers with you! -	XP and hourly chime rates for named-island (“low-tier”) resources. -	XP and hourly chime rates for uncharted isle (“high-tier”) resources. -	Some (but far from all!) changes that are coming in October’s update. Please note: With the release date fast approaching I might not be able to answer all of your questions and/or some of the questions might be out of my reach. I still thought it would be nice to share the numbers for those who are interested. •	XP per hour from named-island resources has been increased by 25-40%. •	Wobbegong XP per hour has been increased by 10%. •	XP for crafting tortle bowls has been increased to 75 (up for 10). •	XP for crafting ornate tortle bowls has been increased to 100 (up from 10). •	XP for fletching bamboo bundles has been increased to 100 (up from 10). •	The amount of resources gained per hour from named-island resources has been lowered by 10-15%. •	XP lamps have been reduced in price by 10-20%. •	Long voyages now cost 20 supplies (down from 25). •	Supplies will be 25 chimes per supply (down from 40) and supply cost reduction upgrades reduce this to as low as 10 chimes per supply (down from 20). •	Supply cap now starts at 200 (up from 100) and increases to 1,000 (up from 500) with upgrades. This change will be applied automatically at launch. •	Arc gumbo sells for 65 chimes (up from 45). •	Shark soup sells for 85 chimes (up from 50). •	Island customisations have been reduced in price. •	Rosie’s supply crate will have 5 supplies added to it every day (regardless or not of whether you log in or collect them) up to a cap of 50 supplies. It will be full for everyone when next they arrive on Waiko. The above are just a few patch notes that you will be seeing once October’s Arc additions hit the game. Being a veteran and mostly XP-focussed player myself, I would often read through the Wiki and follow the forums/Reddit for the newest additions. With the release of The Arc, we’ve not officially disclosed the XP/chime hourly rates to help keep the sense of exploration. Reading through forums and fan sites, it has been quite amusing seeing different claims of XP/chime rates, which were (mostly) quite off. Skilling within the Arc works slightly differently from elsewhere in the game – the success chance is lower, but the XP-per-action is greater, which creates more outliers. We’ve agreed to disperse the mystery and provide you with numbers that you’d expect to get if you’d take the average of many days or even months. Firstly, let’s see which boosts work within the Arc that are most commonly used. I’ve excluded some situational/not as widely available boosts such as auras, skillchompas, RaF, Bonus XP, Valentine’s slam, extra XP from pulse cores, beach cocktails, dwarven tools, etc. Below are all Arc skilling resources showing the average XP rates without boosts, average XP rates with boosts, and then the same again for chime rates. Please note that these numbers are what you will be experiencing once the Arc update is released on 10th October. 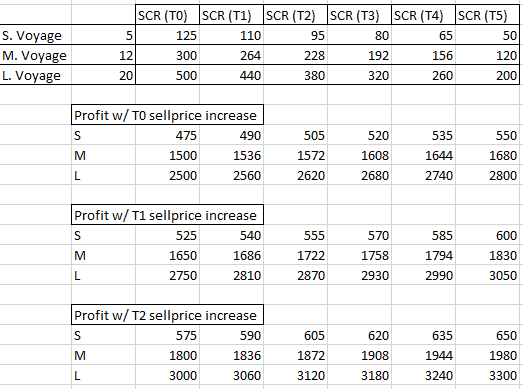 These rates are based on having level 99 in the respective skill and the chimes/hour rate does not take into account any sell price upgrades you have purchased. The boosted rates below are by no means the absolute maximum they can be due to the exclusions listed in the previous paragraph. Only the boosts listed above (outfits, potions, perks) are taken into calculations. As I’ve mentioned in the opening paragraph, we’re reducing the cost of supplies and the supply cost to travel to large islands. This means that you will be able to travel to uncharted isles and bring back more chimes than you did before, and so travelling to uncharted isles will become significantly more efficient than chopping bamboo on Waiko or fishing on Whale’s Maw. 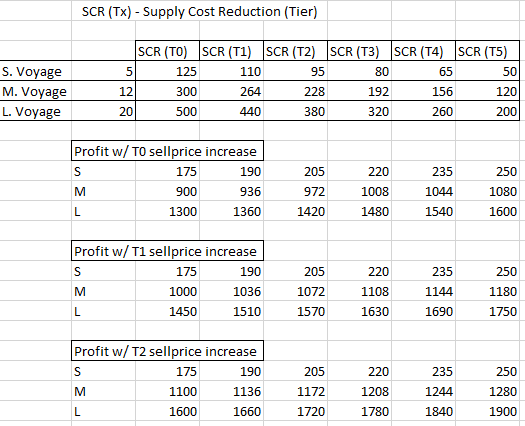 The above shows guaranteed minimum (0.5 rare resource per small island, 2 per medium, 3 per large) chime return from the uncharted isles, taking ‘Supply Cost Reduction’ & ‘Commodity Sell Price Increase’ upgrades into account as well. What does this mean for chimes per hour? Note: you will be able to stay on large islands longer compared to mediums. Medium islands can have 2 to 3 resources whilst large islands can have 3 to 5. As you can see, the chimes per hour on uncharted isles have been buffed, the islands you claim will now have even more resources and the XP rates have been buffed as well. Not to worry if XP is not your thing – there are many other rewards coming with this update too! Hopefully, you have found it interesting and we will be seeing you in-game on 10th October. Nice read! I'm always a bit of a sucker for statistics, but I hope the mentioned upgrades will draw me back to the Arc. It's a beautiful place, but after completing the miniquests all that was left was skilling. And looking at my avatar... Well, you get the picture. Anyhow, still need to get the completionist requirement there, so I'm glad to see these changes! Thanks! Numbers are always cool to see. I had no idea some of the XP rates were (or are going to be) so high; I think I'll be hanging out in the Arc more often in the future. Does this mean a Wobbegong nerf? •\tWobbegong XP per hour has been increased by 10%. •\tThe amount of resources gained per hour from named-island resources has been lowered by 10-15%. Wobbegongs only received a buff. Named islands do not include uncharted isles hence only the "low-tier" resources have been affected. I assume these chime rates are taking into account bundling/ cooking fish oil time? Also Waiko fishing being the same chimes /hr as Whale's Maw, maybe with porters? As there's no deposit box there. Regardless, awesome statistics to have (I strongly believe we don't get enough official numbers), so thank you! Arc is my favorite place in rs, great to see it getting some love! And why weren't the scrimshaws for fishing and mining included in the xp and chime calculation...? Same reason as skillchompas & auras; they're consumable and not "permanent". Re: "woodcutting scrimshaws/urns" - we have a job in the backlog to allow those. If everything goes well - they should work on launch. Worst case scenario it would be a post-launch patch note.